Paul Connor has kindly sent a photo of his model of the 10ft double-ended skiff from Practical Boatbuilding for Amateurs, together with his extensive set of computer-generated construction drawings. There’s a good amount of background to this project. The original drawings and information from Practical Boatbuilding are here, an earlier intheboatshed.net post on the model project is here and two threads discussing the Practical Boatbuilding skiff and Paul’s project are here and here. For Paul, the model is a proof of concept that shows the boat can be made at full size using the clinker ply technique, but I think many people will enjoy making a model of this little boat. I hope they do. I think the model shows two things. The point that a boat built the these old plans is practical and will be beautiful is clearly the first, but the second is that in my opinion the boat itself would be even more elegant and better in the water if made 12-18 inches longer on the same beam and draught. Download Paul’s pdfs of the drawings here: sheet-1; sheet-2; sheet-3; sheet-4; sheet-5; sheet-6; sheet-7; sheet-8; sheet-9; sheet-10; sheet-11; sheet-12; sheet-13; sheet-14; sheet-15. PS Readers interested in making a model of something simpler, might check out the free plans page! Don’t miss out – subscribe to intheboatshed.net’s free weekly email newsletter now! Not sure if you can help me or not. 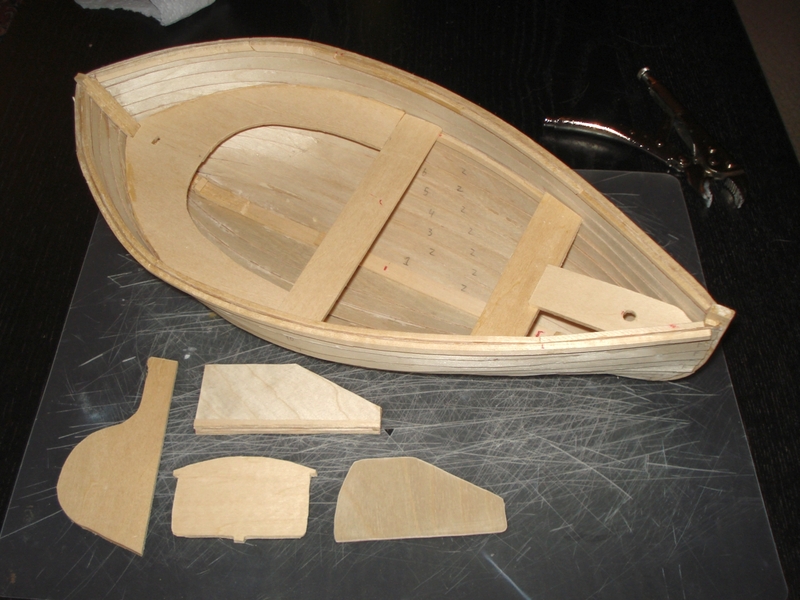 I need to build a wooden model boat about 2 foot long and about 6 inches wide (dimensions can vary). All i need are the most basic of basic plans. All this needs to do is float and be stable. The more stable the better. I know nothing about boats model or real. Would you have any idea where i could get very minimal and basic plans (preferably free). Whatever you choose, just print out sheets and tape them to the model plywood (or balsa wood) and cut them out. Be careful when printing or the scale might not come out as you want – not that it should matter much, since as long as the sheets are all the same scale everything should go together without much trouble regardless of what the scale actually is. Good luck on your model, and I hope you keep us informed. This seems perfect for my needs. By way of a little background i prefer to make model war machines (trebuchet, catapults and the like) I had an idea for a trebuchet to be used at sea and i need a boat to see if it's possible. If nothing else it should keep me occupied for a few weeks and should be a bit of fun. Thanks a million for your help and depending on results i might send on a few pics. Some pics would be great please!